Accessing Guild Wars: Tap your Guild, then tap Events. 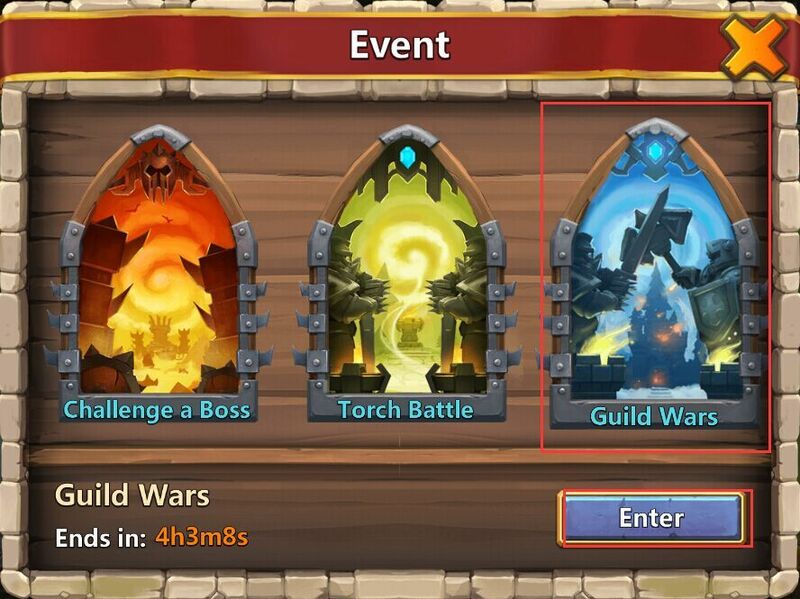 Event Time: Guild Wars run every Thursday and Sunday from 00:00 to 23:59. It lasts 24 hours. 1) Tap “?” to view the rules for Guild Wars and a summary of the rewards obtainable. 2) Here you can view the other Guilds in your group and their Might. 3) Here you can view your Guild’s points, your own points, and the guild reward. 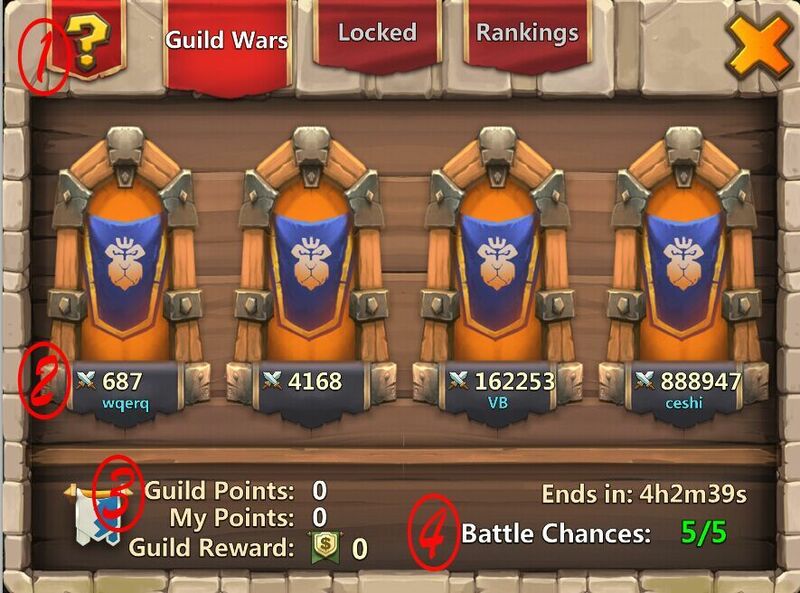 4) This is the remaining chances you have to attack players of other guilds and the time left before Guild Wars end. In the Guild Wars rankings, you can view the rankings of Guilds in your group, their Might and points, and the Might and point rankings of individual members of your Guild. 1. Every guild member taking part in Guild Wars have five chances to attack another player. You can attack any member of the other Guilds in your group. If an attack fails, chances are not used and there will be no losses. 2. You can’t defeat the same player more than once. Players that you have successfully attacked will be grayed out. 3. All troops in your Army Camp and Heroes on your Hero Bases can be used for an attack in Guild Wars. If the attack was successful, losses are recorded and Heroes that died in battle will have to be revived. 5. When Guild members earn points, these points are tallied into Guild points. The Guild’s point ranking within its group will affect the bonus every guild member gets to their Fame rewards. You can earn individual rewards and Guild rewards from Guild Wars. 1. Individual Rewards: Fame and Honor Badges. You can collect these rewards from the Guild Wars event page after the event. Honor Badges rewarded: This would depend on your point ranking within your own guild for this Guild War. 2. Guild Rewards: After the event, Guild Credits will be sent to participating Guilds. 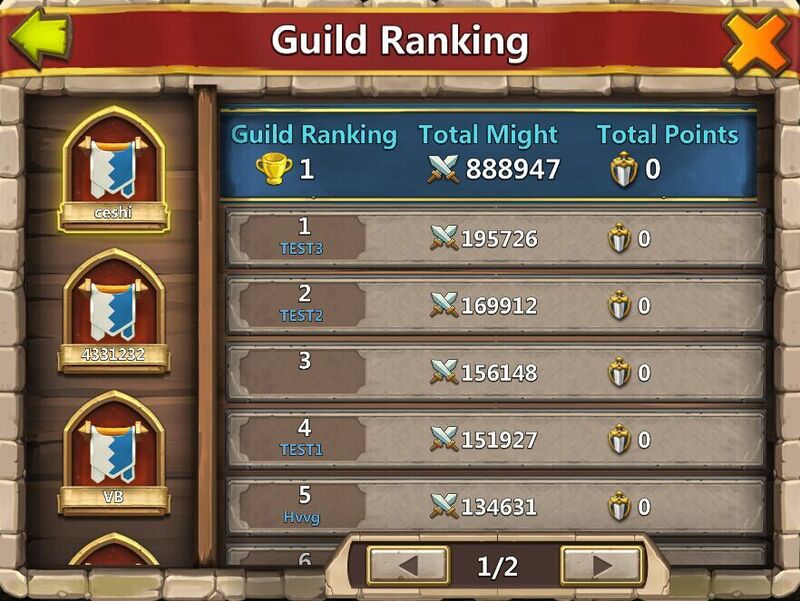 So only the top 4 guilds out of 400 will win Fame, or am I reading this wrong? Each group has 5 guilds. 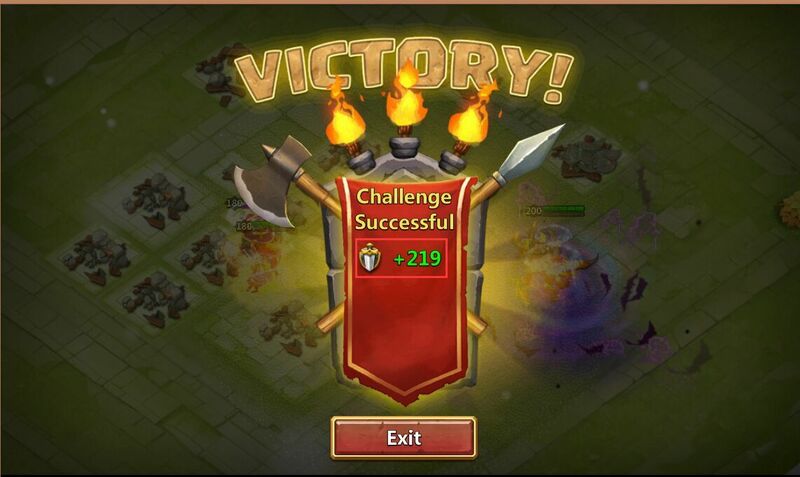 Ah, so it's pretty much Guild Wars from Clash of Lords. 400 groups will form each GW day. And the last place guild in the group gets owned with nothing. Top 2000 guilds only, so its even more elitist than torch battle. 1 million thumbs down from me! The guild of my friend and I not even enter the torch battle yet, another 1 million thumbs down from me. Any idea how we can set a specific base for guild wars? Is the base set at the beginning of the event only or does it change throughout the event if we make changes to heroes on hero bases, garrisons, general build design etc? I noticed they took out the 3 base design options, so it's now much harder to change your base than it was before the update. Want to know the answer to this too!!! A guild credit is a donated shard. Does a successful attack on an opponent's base cause that base to be grayed out for other guild members and other guild's members as well, or only to oneself? Really good question, would be nice to know. your guildies can attack them even if you have already successfully raided them. This has been the case from the beginning. I used to love to find peek with no heroes on base, wipe them out ,and then let everyone know to hit them as well.